The Albert Park Golf Course is situated in picturesque Albert Park just 2km from the Melbourne CBD, and adjacent to the famous St Kilda Road Boulevard. The 18 hole course is one of the best courses ..
ausgolf brings you a search facility with detailed information on Australia's public, private and resort courses; and with additional data provided by Ryan Publishing our total directory of over 1500 ..
Bald Hill Park, Clarinda (Clayton) Great playground with nice walking and biking tracks around the park. 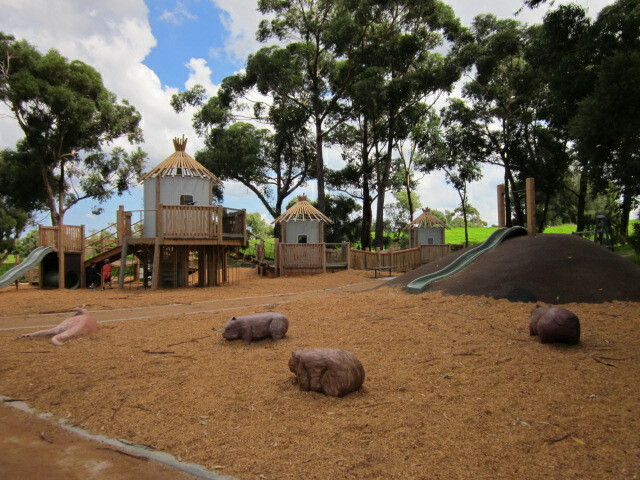 Bald Hill Park Playground Very unusual and interesting playground. There are three o ..
Melbourne's Premier Indoor Golf Facility Big Swing Golf is the ultimate indoor golf experience, conveniently located and ready to play - even in the rain. INDOOR GOLF - REAL, FAST, FUN Featur .. Located on the banks of the Yarra River, the course has been designed around this natural setting. Combining natural water hazards, strategic bunker placements and fairway design, the course offer ..
Commonwealth Golf Club is rated highly amongst Australia's top golf courses. The Club has hosted Australian Open Championships, as well as other major events such as the Victorian Open, Australian ..
Australian Disc Golf (ADG) is the national peak body for disc golf in Australia. Disc Golf Australia was started in 2001 after researching the game's history overseas and here in Oz. DGA is a reg .. The DOT PLX putter has a 2D Parallax Alignment System that ensures a correct and properly aligned putting stroke is achieved every single time. The putter's design aids the user in imparting maxim .. The course is in a lovely woodland setting where birdlife abounds and you might see an occasional fox in the late afternoon. Although it is not long by todays standards, the course provides a real ..
Gold Rush Mini Golf offers fun for the whole family with two fully themed 18 hole courses! -:- All Weather Themed Indoor Course -:- Themed Outdoor Course -:- Function/Conference Room -:- Arcade .. Golf Australia formed in 2006 and is the National Sporting Organisation overseeing the future of golf in Australia. Our goal is to raise the level of interest and participation in the game from gra .. Golf Ball Busters is your one-stop online store for quality golf balls at greatly discounted prices! Golf Ball Busters stock Titleist, Nike, Callaway, Srixon, Bridgestone, Maxfli, Precept, Pinnacle ..
For all you golf tragics who go out there every weekend and hack around the course, here is a video showing you just how easy the game of golf is... View Video (WMV) .. Play golf courses on indoor golf simulators and practice on a virtual driving range. THE GOLFTEC EXPERIENCE Australia's only indoor golf improvement facility that combines Ball Flight Tracking Tec ..
Huntingdale's premier championship 18 hole "sandbelt" course is home to the Australian Masters and has played host to some of the most famous names in international golf, including Jack Nicklaus, Greg ..
With a ranking of 2 in Australia and with a world ranking of 21 Kingston Heath Golf Club is not only one of Australia's, but also one of the world's leading golf Clubs. It has hosted 7 Australian .. The Course is challenging with the front nine having the most opportunities to build a good score. The back nine gets progressively harder and the whole Course rewards good thinking and strategy. ..
Latrobe Golf Range and Adventure Minigolf Latrobe Golf Range 32 All-weather Undercover Driving Bays | 2 large Grass Teeing Areas (10m x 4m) | Flood lit Play by the bucket Free club hire Rang ..
Latte Golf is a golf development program for women who want to learn about how to play the game and develop basic skills. Coaching sessions are conducted in small groups over 4 weeks by an experien .. Le Brocque Golf Academy delivers the highest quality in Golf Instruction and Golf Education programs. Been operating for over 10 years with world wide recognition on the programs delivered from this G ..
Maroondah Adventure Golf Park with Mini Golf and Hedge Maze was established in 1996 and is proudly Managed by Belgravia Leisure. There is something here for everyone from the golf enthusiasts to t .. The Melbourne Disc Golf Club is a not-for-profit organisation which aims to create a local community of players and to spread awareness of this enjoyable, challenging and environmentally responsible s .. Whether you're a weekend social golfer, rising star, or super star, you'll find everything you need at the Melbourne Golf Academy. We doubt you've ever had the pleasure of enjoying a practice facil .. Here are the Golf Courses on the Mornington Peninsula... Devilbend Golf Club Loaders Road, Moorooduc. Mel Ref: 152 K1 An 18-hole 6250m course that has couch fairways, automatic watering and ex ..
Patterson River Golf Club offers first class facilities including golf course, pro-shop and function rooms. Golf This superb sandbelt golf course located in Melbourne's southern bayside suburbs, h ..
For the official golf news and golf results visit the PGA Australia website. PGA of Australia aims to promote the game of golf locally and internationally. Founded in 1911, the PGA of Australia is .. The Melbourne Golf Club has existed continuously from 1891 and is regarded as the oldest golf club in Australia. The privilege of adding the term "Royal" to the Club's name was granted by Queen Vi ..
Spring Park Golf Course & Dingley Village Adventure Golf Melbourne's Best 9 Hole Golf Course The Most Exciting Miniature Golf in Town! ..
Stuart Appleby Junior Golf is the most exciting venture that Victorian junior golf has seen for some time! SAJG is Victoria's first junior golf foundation and is a not-for-profit organisation spec .. This 9 hole course features all Par 3 holes and is ideal for the beginner, senior, or relaxing game of golf. With stunning views of the city from the Course, Studley Park makes for an informal rou ..
Wetlands Golf 'n'Games is a unique entertainment venue where people of all ages can enjoy mini-golf, hold a party or function, play our arcade games or just enjoy a cup of coffee and delicious snack a .. Adventure Golf is OPEN.. The first 18 (East Course) of the 36 hole Yarra Bend Adventure Golf opened in January 2014, with the West Course (2nd 18 holes) to open in March 2014. Yarra Bend Adv .. The Yarra Bend Golf Course is situated in Yarra Bend Park, Fairfield, only 4 km from the Melbourne CBD. The majestic Yarra River hugs the edges of this scenic course, providing picturesque views o .. Ideally located Yarra Valley accommodation right at the gateway to the beautiful winery region only 45 minutes from Melbourne CBD. Located on the grounds of the privately owned and independently op ..